Empowering HR with intelligent employee support. Provide 24/7 support to your workforce with an easy-to-use virtual assistant. Employees can get answers to common workplace requests quickly and easily by accessing the assistant with chat, email, voice, or text. Give your employees a way to help themselves. Reduce helpdesk impact while increasing engagement. 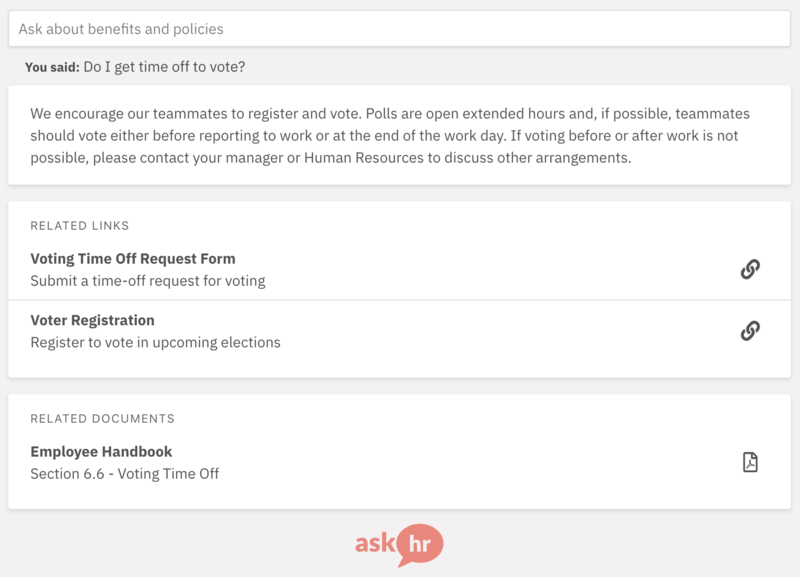 AskHR is a friendly, cloud-hosted virtual assistant that understands your HR policies and procedures. Employees interact with our assistant using a mobile device or laptop and ask questions like "I need to update my W4." The platform will provide answers, relevant information, walk the employee through necessary steps, or capture the request for HR follow-up. What's a virtual assistant, anyway? AskHR integrates with your existing communication channels or internal website. Employees can ask questions using natural language and get an immediate response.